Rural and urban women were brought together in a series of workshops held in a number of different institutions, to celebrate the recently concluded International Rural Women’s Day. 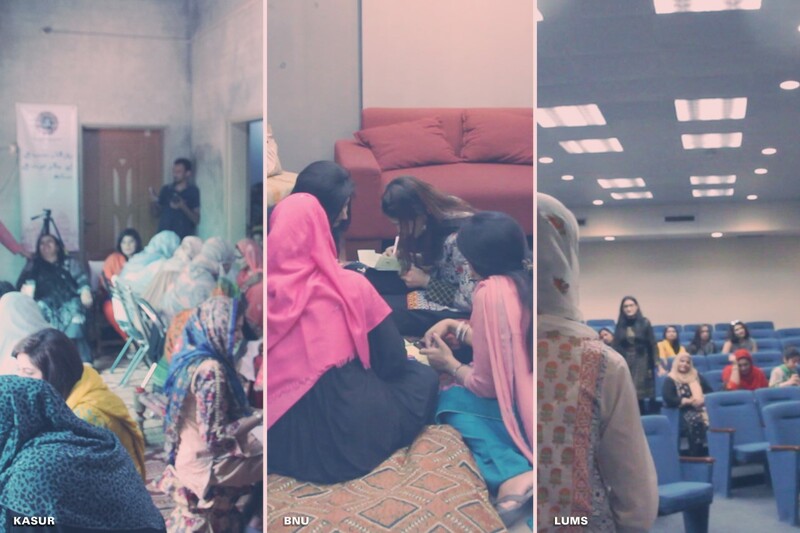 The workshops organized by the Kaarvan Crafts Foundation put together Pakistani women from different backgrounds to bring into open discussion regarding feminism in Pakistan and the different gendered problems that all women have to face. The method they used in these activities were that of “visual interaction” to minimize cultural and language barriers between the two social groups. The workshops, defined as “tangible thought experiments,” hoped to address the problem of “otherness” by engaging in storytelling and dialogue in order to better envision the reality of our rural neighbors often treated as the mysterious “others”. The objective of Karaavan’s effort was thus to explore diversity and commonalities through the medium of open dialogue, photo-study, and other such activities. The main goal was an attempt at inclusion — where rural women can speak for themselves in an environment where women from all backgrounds could be comfortable speaking about their gender. The week of community engagement began on International Rural Women’s Day, October 15th 2017 at Kaarvan’s Training Center of Livestock in Kasur. The workshop consisted of large “talking circles” where the general understanding was that urban life is superficial and materialistic. However the conversation moved to the urban setting as the next few workshops were held at Beaconhouse National University (BNU) and the Lahore University of Management Sciences. What could be discerned from these dialogues was that social pressures are present on both sides but the contextual manifestations are different. The entire concept was even more fascinating considering that the vast language barrier was covered through Karaavan’s predominant use of ‘visual activities’ to avoid any such problems. Overall, the workshops were a productive way to commemorate Rural Women’s day by familiarizing them with urban women and the commonalities they share, as well as giving urban women a taste of life outside the fast lane.